This potato recipe has always been a favorite of mine and is loved by anyone who comes over for dinner. Derrick came up with this delicious recipe of taking potatoes and turning them into a gourmet style side dish. While I am going to promise this dish will help you lose weight or not stick to your thighs… it’s worth it to cheat for a night and try this delicious dish! If you do try it, come back and let me know what you think! 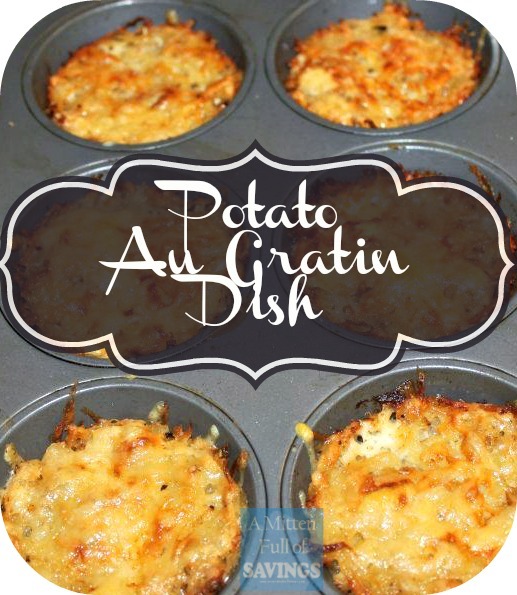 Au Gratin Potatoes goes great with other side dishes such as Creamy Collard Greens. And of course, our easyThanksgiving Stuffing (Dressing) recipe is a must to serve with this easy potato recipe! For budget purposes, if you do plan on making this meal, I highly suggest that you grab the items when they are on sale since they can add up quickly in cost! Wash and rinse potatoes. Cut into quarters, shred or slice thinly in a food processor. Take them out of the food processor and place potatoes in a large bowl. Chop onions and mince the garlic then set aside. In a cast iron skillet fry bacon until crispy, set aside on paper towels to drain. Add heavy cream, olive oil, crumbled bacon, minced garlic, chopped onions, and cheeses. Combine thoroughly adding freshly ground black pepper and sea/ or kosher salt to taste. Using a medium-sized scoop or a tablespoon, fill buttered muffin pan holes with potato mixture. Top with more cheese and bake in oven at 375 for 30-40 minutes until potatoes are golden brown. Chop onions and mince garlic then set aside. Add heavy cream, olive oil, crumbled bacon, minced garlic, chopped onions, and cheeses. Combine thoroughly adding freshly ground black pepper and sea/ or kosher salt to taste. Using a medium sized scoop or a tablespoon, fill buttered muffin pan holes with potato mixture. Top with more cheese and bake in oven at 375 for 30-40 minutes until potatoes are golden brown. Remove from oven and let rest for 10 minutes before serving. Previous post BBQ Recipes & Watermelon Ideas From Monsters University!